Since its legalization back in October, the demand for cannabis in the market has been at an all-time high. While legalizing cannabis has opened the door for a number of different markets, Peterborough, Ont.-based Canveda aims to make a prominent name for itself in the medicinal marijuana sector. 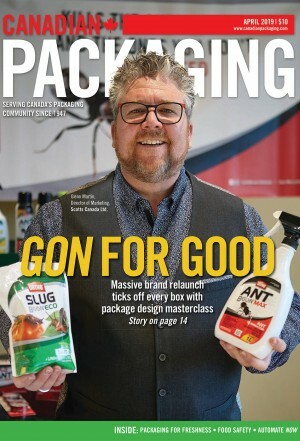 “I think in every business you have to find a niche that can separate yourself from your competition and focus on your niche to become the best in that,” Michael Arnkvarn, executive vice-president and chief operating officer of MPXI Canada and Canveda, says. 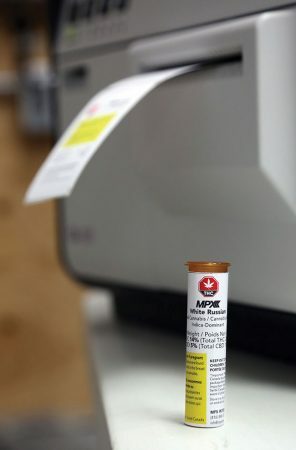 Bought by MPX Bioceutical Corporation back in June 2018, Canveda, with approval from the CRA (Canada Revenue Agency) and Health Canada, is currently starting production and will be producing about 30 different strains. 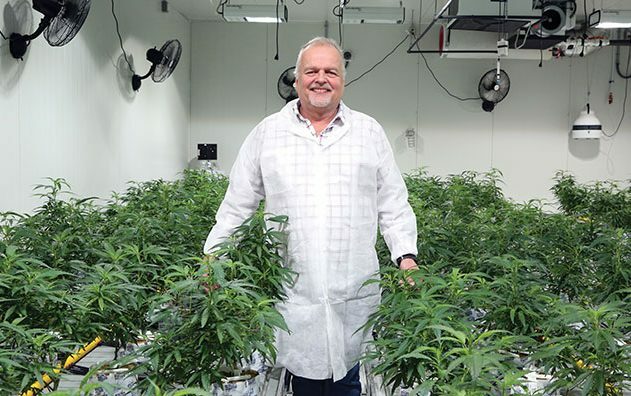 “Obviously you want to have different strains to try and differentiate yourself as a cannabis producer versus your competitors,” Arnkvarn explains. “Our philosophy is to focus more on producing finished products, in addition to producing specialized products. “Canveda has a joint venture with the largest cannabis Pharmafarm producer in the world from Israel, Panaxia and we’ll be producing products with them together. In compliance with Health Canada’s laws regarding packaging and labeling cannabis products, Arnkvarn and his team purchased a Kiaro! QL-120 Professional tabletop digital label printer from Astronova Inc. While this facility produces only flower, Arnkvarn says that this will not be the way that the Canadian cannabis market will continue in, as there will be a demand for other specialized cannabis products in the likes of oils and edibles, which will be allowed to sell in Oct. 2019. 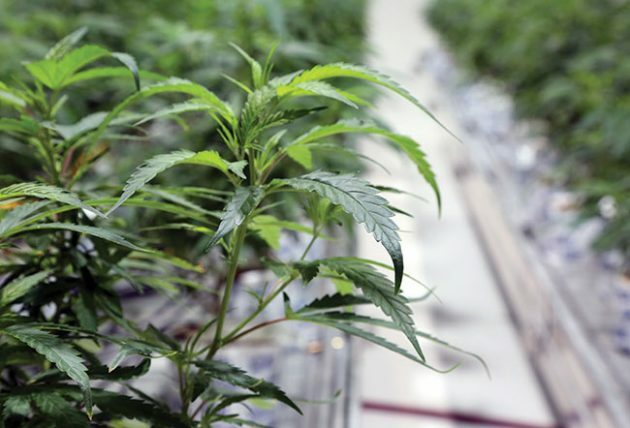 “If we look at the history of the cannabis markets in the U.S., typically when a new market starts, it’s almost 80 per cent flower, and very few derivatives,” Arnkvarn told Canadian Packaging on a recent plant visit. Whether packaging flower or edibles, all cannabis products must be packaged in the same way. According to a lengthy report from Health Canada, all cannabis products must abide by a number of strict packaging and labeling laws since marijuana became legal. Packaging would also have to include a “universal symbol” denoting that it is a cannabis product, as well as a health-warning message inside a yellow box printed in the largest font on the label. 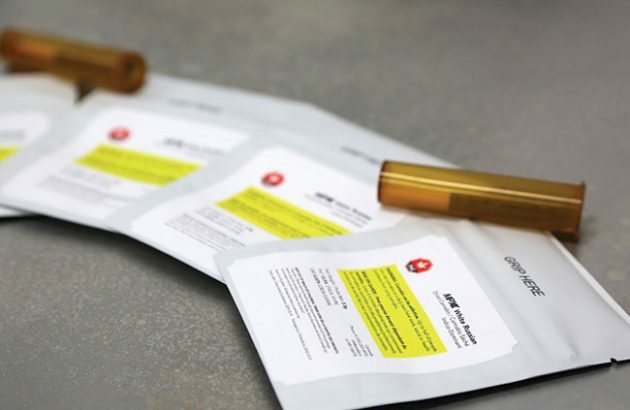 Cannabis warning labels must include a number of different information, including product description, THC and CBD content, potential allergens and varied warnings in a yellow box. With a background in natural food health and producing lots of products, Arnkvarn’s instinctual train of thought was to get a color printer and have the labels made promptly, in-house. After being reminded about the precise regulations surrounding packaging and labeling cannabis, Arnkvarn had to look no further than his influx of unread emails. team. They were immediately convinced that this was the printer for Canveda. 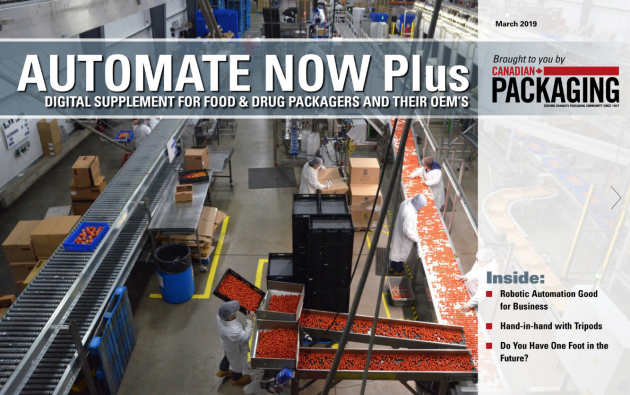 “It’s an essential item, you cannot package and you cannot function without it. “Emails do pay off,” Arnkvarn adds with a laugh. 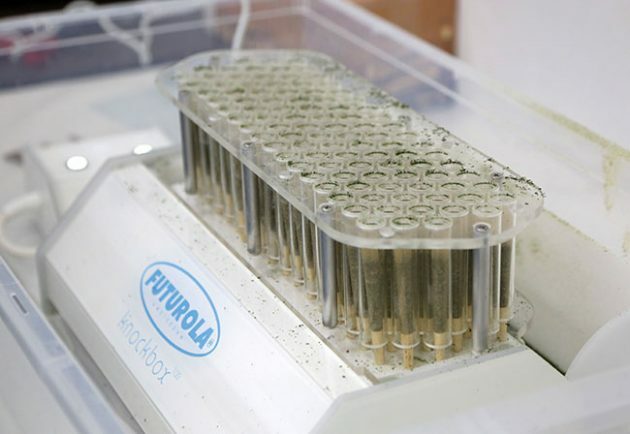 The Futurola Knockbox 2 + Standard Filling Kit has the capability to fill over 100 pre-rolled cones with the cannabis product in a brisk two minute interval. With its original launch back in 2018, the QL-120 has already made a positive impression on customers in a number of different sectors. 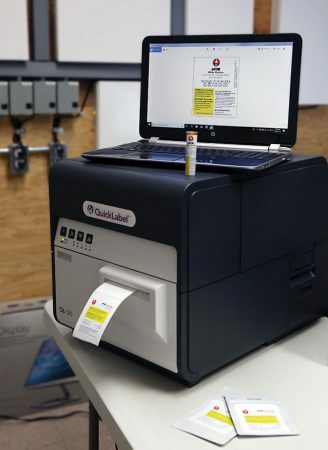 Having been applauded for its network-friendly printer operations and a compact design, the QL-120 manufactures premium 1200 x 1200 dpi (dots per inch) color labels in a timely and cost-effective method. Offering flexible print widths that are unmatched in the industry, the QL-120 enables Arnkvarn and his team to print labels as narrow as 0.5” or as wide as 4.2” on the same device. Thanks to a function-rich Windows operating interface, completely integral utility and status monitoring software, the QL-120 helps users to straightforwardly and tenuously manage printer setup and operation. In addition, the QL-120 also features self-maintenance during the printing process, which has resulted in the highest quality printed labels with little to no user intervention. Having had the QL-120 installed at the plant for a little over a month, a professional graphic artist is in charge of designing the labels to the government’s strict requirements. A close up of the finished packaged products with the cannabis warning labels, prior to distribution. 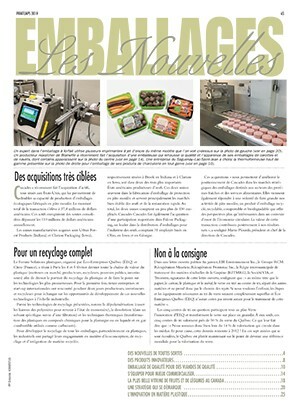 Arnkvarn also shares that Canveda benefits from the label printer’s well-adapted settings and ability to provide them with different label sizes. 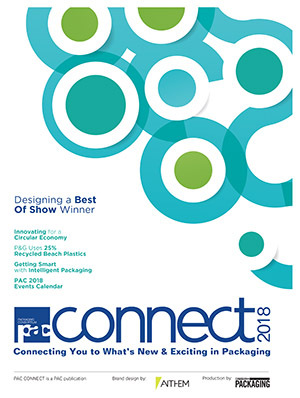 “When you’re doing labels or you’re doing even any printing materials, they become out of date every quickly,” Arnkvarn explains. While he does not want to change his supplier, one thing that Arnkvarn would like to change is the public’s perception on PTSD (Post-traumatic stress disorder) seen in veterans. 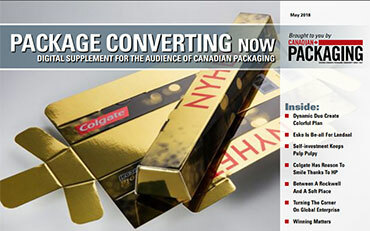 With their lead grower a veteran, the cause is near and dear to Canveda. Canveda supports and promotes a group called Spartan Wellness, which is a network comprised of veterans, physicians, specialists and other support teams that work to help other veterans recover from opioid addictions and the often-tragic repercussions of PTSD. A fundamental element of the program includes converting the struggling veterans away from opioids and towards medicinal cannabis, which Canveda provides them. Medical marijuana has been shown to be an effective source of treatment for different mental and physical conditions, such as depression, anxiety and cancer. Recognized as veterans helping veterans, the Spartan Wellness program acts as not only an economical solution for struggling veterans, but also a social one. therapy to the veterans has been promising. While Canveda currently produces only flower, they will in the future begin to produce other specialized cannabis products such as oils and edibles, as the cannabis market will have a higher demand for it once these derivatives become legalized in October 2019. “Ever since they have been able to convert the veterans to cannabis, Spartan Wellness has had great success in reducing opioid addiction,” Arnkvarn extols. While Canveda stands at a mere 12,000-square-feet with plans to add a number of trimmers and machines, there are no immediate plans to expand the facility. Arnkvarn explains that the focus of Canveda as a business is not to compete with big name cannabis production corporations, but instead to focus on the needs and the accommodations of the veterans in the Spartan program. After the tragic bus crash in Ottawa at the beginning of the year, Canveda would like to expand the Spartan Wellness group not just to veterans, but also to first responders and police officers who are also experiencing PTSD. Arnkvarn says that the goal is to have medical cannabis become much more mainstream. “We’re really just going to use this facility to fulfill the needs of our veteran group,” Arnkvarn says.